If you are interested in supporting the Kenyan people by offering your skills and your commitment your are truly welcome. Since 1999, more than 40 volunteers have conducted voluntary work at the schools. 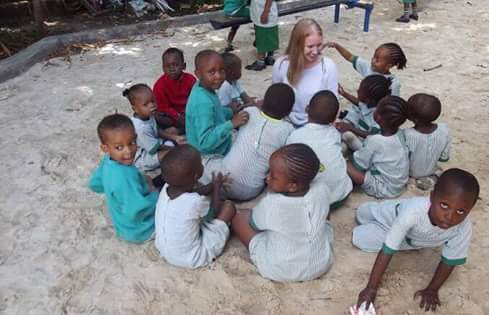 All of them survived and all of them were enthusiastic about their experience, even if life in Kenya isn’t always easy for a volunteer, if not outright tough. You pay for flight and other travel expenses yourself. You pay for accommodation, catering and transport expenses yourself. You have a passport valid for at least 1 year when you arrive in Kenya. You have a tourist visa for Kenya (which can be obtained at Mombasa Airport). You have a minimum of vaccination. You will respect our Codex. You will obey the behavioural rules. Why do I have to pay 1.000 Euros? Voluntary work at Mekaela Academies does not come for free. The school has to organise things, its staff is kept busy, and other expenses incur. Therefore, 500 Euros of your money go to the school to make up for its efforts. Too often for our taste, Mekaela Academies faces unforeseeable expenses, such as fees or taxes for visa extensions, temporary work-permits, etc. Sometimes volunteers simply forget to settle the final bill with their landlords. It has happened that volunteers got themselves into trouble an required the help of a lawyer. Therefore, you pay a deposit of 500 Euros which will be available to Mekaela Academies in case of an emergency. If everything goes well we will return the deposit (or what is left of it) to you at the end of your mission. Why do I have to pay for all expenses myself? An experienced Kenyan teacher is earning a salary of 25,000 Shillings per month (around 250 Euros). Thus, it would be justifiable to use donor funds to support volunteers. What are the minimum expenses I would have to expect in Kenya? If you can abstain from luxury you should expect to part with around 30 Euro per day which should be sufficient to cover the cost for accommodation in a pension or a small hotel (without air conditioning and without a swimming pool, for instance the “Eden Drops” in Diani Beach) including breakfast, daily trips in Matatu buses and other everyday needs. During the day, you can take food at the schools. In supermarkets imported consumer goods are almost as expensive as at home, but local products are really affordable, so you should be able to cope well with 900 Euros a month if your expectations aren’t too high. Which vaccines and prophylaxis do I need? Which qualifications should I have? It would be helpful, but not conditional, if you have some experience in the field of education. You should enjoy teaching and dealing with children. You shouldn’t be too shy to establish social contacts, and open to learn new things, especially about African society and culture. Skills in computer technology and software are in very high demand. It would do no harm if you had a certain talent for improvising. What is the project’s Codex? You will find the Codex on our website under the menu item “The Society”. What are the behavioural rules? Kenyans appreciate a lot of old fashioned values, which often differ greatly from our modern and liberal European values. Some rules we might find difficult to accept or just understand. Kenyans give Europeans some leeway, for instance regarding consumption of alcohol or tobacco, or simply the use of (for them rough) language. You will however never experience that female teachers would smoke or drink a beer in public. Fortunately, these tough rules are rarely applicable to us. Still, you should always consider that all our activities in public are apprehended under the condition that the Kenyan parents confide their children to us. If our behaviour in public suggests we are contemptuous of the parents’ values, we have a problem. Avoid falling from the bar stool completely plastered, crawling home or to the nearest taxi. Never ever buy or consume drugs other than alcohol and tobacco. It would be a serious offence in Kenya with fierce penalties, and we couldn’t get you out of prison even if we wanted to – which we wouldn’t. Do not start a relationship with a teacher or other members of our staff, married people or gentlemen or ladies with disputable reputation. If you were just a tourist, no one would bother, but it definitely will have consequences when you are a volunteer for our institution. When speaking English, avoid using obscene vocabulary, swear words or any other bad language that would definitely have gotten you a “D” for your English essay. We could never explain to our parents, or expect them to understand why you would refuse to respect their values and harm the reputation of our schools. How do we assist you in becoming a volunteer? We help you communicating the management of Mekaela Academies. We help you to contact people who have been volunteers before you. We advise you in planning your mission. We pick you up at Mombasa Airport, if you like. We organise a clean and secure accommodation in line with your finances. We deal with local authorities regarding permits, visas, licences, etc. We calm and inform appalled parents, friends and relatives. Sounds good, now how do I get to Kenya? A brief CV with the most important personal facts and data. Your motivation for becoming a volunteer. Duration and period of your anticipated stay. Your qualifications or experience, e.g. through your job, studies or training. A confirmation that you have read and understood this page and do accept the terms. As soon as you have agreed with the school about the duration and time of your mission, you will receive a confirmation in writing from us. Then, you should try to book a cheap return flight to Mombasa, e.g. with Condor or Turkish Airlines, but there are other international charter carriers, too like Monarch, TUIFly, Edelweiss, Corsair etc. which offer cheap fares for flights to Mombasa. Once you have your tickets please do inform us about your flight details, and we can arrange for your transfer from Mombasa Airport. And off you go! Upon your arrival in Kenya, we will take you to your hotel, pension or flat in Ukunda or Diani Beach. As you will most likely arrive in the morning, you may use your first day just to settle down and relax, because the flight will be exhausting and the climate none the less. The next morning we will pick you up and drive you to one of the schools, where you will meet the management to discuss your schedules, objectives, the dos and don’ts and other useful, interesting and important details regarding your mission. Once you are through with this your mission begins, and you will be right in the middle of the action at an African school. You will love it!